« A Beau start to the day–to the year! This recipe is adapted from one I spotted in The New York Times a few weeks back. 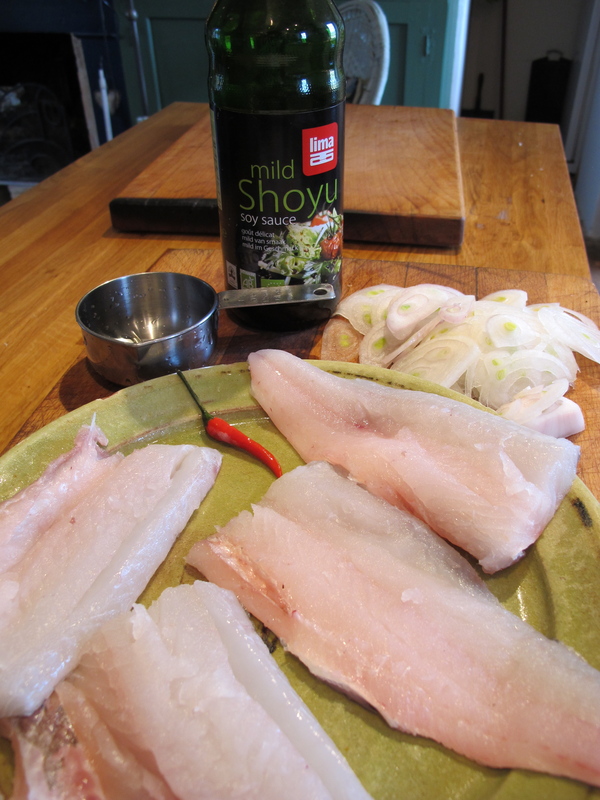 It is quick and simple to do with an otherwise bland white fish (often a cheaper option). I found whiting (merlan in France) at the market this morning. The original recipe called for spring onions (scallions), but I couldn’t find them, so I sliced a sweet onion finely and spread it over the fillets bubbling away in the pan. Should work, but it won’t have quite the texture of spring onions. This dish goes well on a bed of brown basmati rice (to soak up the juices) and perhaps a green salad. Bring the soy and water to a boil. Slip in the fish fillets–flesh side down–followed by the onion and whole chili. Cook for about 5 minutes–the time depends on the thickness and texture of the fillets; mine were ready in 3 minutes. Add more hot water if you like–though the fish doesn’t need to be covered with liquid. Lift them out carefully with a fish slice onto a warm plate. Simmer the remaining liquid in the pan to reduce it by about half. Place the fish on top of a serving of rice. Spoon over some of the sauce and serve. No need for extra seasoning–the soya sauce is salty enough. In the event Meredith preferred a poached egg on toast! understandably not quite ready for something as savoury as this. 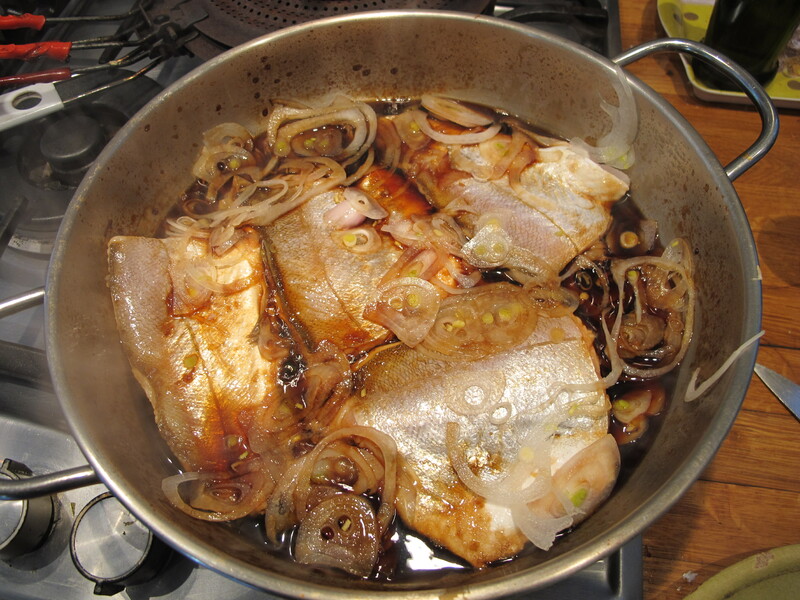 We named “pesce smeriglio”…and I love this good and simple fish and sweet onions! Thank you! Bea p.s.have never eat Certaldo’s fresh onions? That looks lovely! I adore food like this, so simple yet utterly delicious!